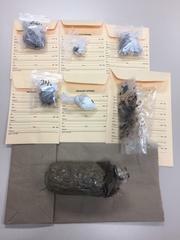 On March 21, 2019, Detectives from the Ventura County Sheriff’s Office East County Street Narcotics Team concluded a narcotics sales investigation into Hernan Cortez of Ventura, who was involved in the sales of narcotics to residents of Ventura County. On March 21, 2019, Detectives contacted Cortez in the area of Santa Clara Street and Oak Street in the City of Ventura. Detectives detained Cortez pursuant to a signed search warrant. The search warrant allowed the search of Cortez’ person and his vehicle. While detaining Cortez, Narcotics Detectives executed the search warrant on Cortez’ vehicle, which was located at a local motel in the 300 Block of Thompson Boulevard. During the search of the vehicle, detectives located 430 grams of heroin and 12 grams of cocaine. Based on the investigation, Detectives arrested Cortez for violation of Health and Safety Code section 11351-Possession for sale of controlled substances. Cortez was booked at the Pre-Trial Detention Facility and is awaiting court proceedings.